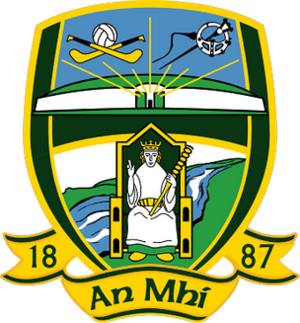 County Meath (/ˈmiːð/ MEEDH; Irish: Contae na Mí or simply an Mhí) is a county in Ireland. It is in the province of Leinster and is part of the Mid-East Region. It is named after the historic Kingdom of Meath (from Midhe meaning "middle"). Meath County Council is the local authority for the county. The population of the county is 194,942 according to the 2016 census. 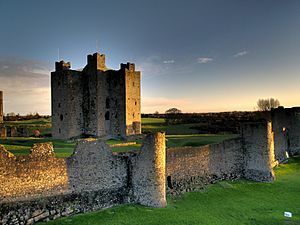 Meath is the 14th largest of Ireland’s 32 counties in area and 9th largest in terms of population. It is the second largest of Leinster’s 12 counties in size and third largest in terms of population. The county town is Navan, where the county hall and government are located, although Trim, the former county town, has historical significance and remains a sitting place of the circuit court. County Meath also has the only two Gaeltacht areas in the province of Leinster, at Ráth Cairn and Baile Ghib. There are 40 elected members in Meath County Council. Fine Gael hold 13 seats, Fianna Fáil hold 10, Sinn Féin hold 8, and there are 9 independents. There are 2 Dáil constituencies, Meath West and Meath East. Before, there was only one constituency. Fianna Fáil has held three seats out of five in the Meath constituency since 1987, Fine Gael has won the other two seats at each in four of the five general elections in that period, with the exception of 1992, when it lost a seat to the Labour party (which was regained in 1997). The two current constituencies are within the borders of the county. The constituencies also include part of the neighbouring county of Westmeath. Together they return 6 deputies to Dáil Éireann. Part of the county along the Irish Sea coast, known as East Meath which includes Julianstown and Laytown-Bettystown-Mornington are part of the Louth constituency for general elections. Fianna Fáil currently hold no seats, Fine Gael have 2 in each constituency, Labour has 1 in the East constituency and Sinn Féin have 1 in the West constituency. The county is colloquially known by the nickname "The Royal County" due to its history as the seat of the High King of Ireland. It formed from the eastern part of the former Kingdom of Mide (see Kings of Mide) but now forms part of the province of Leinster. Historically, the kingdom and its successor territory the Lordship of Meath, included all of counties Meath, Fingal and Westmeath as well as parts of counties Cavan, Longford, Louth, Offaly and Kildare. The seat of the High King of Ireland was at Tara. The archaeological complex of Brú na Bóinne is 5,000 years old and includes the burial sites of Newgrange, Knowth and Dowth, in the north-east of the county. It is a UNESCO designated World Heritage Site. Dangan Castle (Summerhill), the family home of Field Marshal, The Duke of Wellington, Lord Arthur Wellesley, KG, GCB, GCH, PC, FRS. In Margaret Mitchell's novel, Gone With The Wind, County Meath is described as the birthplace of Gerald O'Hara, Scarlett O'Hara's father. 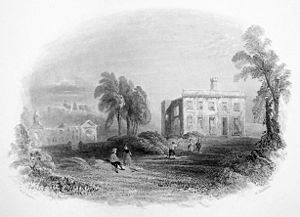 Tara is the name of the Georgia plantation on which the O'Hara family resided. The population in Co. Meath has been characterised since 1861 as being in a period of significant decline. Between 1861 and 1901 the population almost halved (110,373 to 67,497); the population stabilised from 1901 to 1971 (67,497 to 71,729) and there was a substantial increase between 1971 and 1981 to 95,419. This increase was mainly due to a baby boom locally. The population continued to increase at a constant rate, before increasing at an explosive rate between 1996 and 2002, from 109,732 to 134,005. This is due primarily to economic factors, with the return of residents to live in the county, and also an echo effect of the 70s baby boom. The census of 2011 gives a statistic of 184,135 to include a dramatic increase in inward migration in the county, much of it from neighbouring Dublin, and Drogheda. This population growth has seen divergent trends emerge in recent years, with mild depopulation in the north and west of the county being more than offset by large increases in the population of the eastern and south eastern part of the county, principally due to inward migration to districts that have good proximity via road to the business parks on the Western outskirts of Dublin. The accession of Poland and Lithuania to the European Union in 2004 resulted in a significant influx of workers from these countries to work in low wage sectors, including agriculture, quarrying, construction and catering. There are 2,603 Irish language speakers in County Meath, with 1,299 native speakers in the Meath Gaeltacht. In addition there are 1,304 attending the seven Gaelscoils outside the Gaeltacht area. The Greater Dublin area has the highest number of Irish-medium schools in Ireland. County Meath Facts for Kids. Kiddle Encyclopedia.